You know those weeks where everything goes well? You hit all your paces with no problem, your runs all feel great, and you still feel energized! That was how last week felt for me and I am still riding that runner’s high -hopefully right into this marathon! This was another high mileage week and I made more of an effort to do core and strength training exercises which I have somewhat neglected lately. Monday: OFF. Rode my bike alongside the Sport Chek Robson St Training Club in lieu of running because TAKE YOUR REST DAY. I also did the NTC Gracie Gold Core Strength workout. Tuesday: I completed my BIG workout I mentioned last week Training Recap: August 15-21 which I delayed a few days. It consisted of a 20 min warm-up, followed by 5km @ marathon pace, 4km @ marathon pace, 3km faster than marathon pace, 2km @ 10km pace, and 1km as fast as possible before a 20 min cool-down. Smashing this workout renewed my confidence and started the week of on a very positive note. I did core as well with the NTC Gracie Gold Core Strength workout. Wednesday: I did my regular strength training circuit in the morning before work.In the evening, I did 1 km intervals with the Sport Chek Robson St Training Club alternating between 10km pace and half-marathon pace. These guys really pushed the pace and it was great to see them give it their all! Thursday: 95 mins/ 17km easy which was done around the Seawall from BC place to False Creek. Thanks to Jess, my final summer visitor for joining me on this run and providing endless entertainment as she navigated the Seawall on a bike for the first time (and with no crashes)! Friday: 70 mins/ 12 km easy, I took the Sport Chek Robson St Training Club on a run through the trails in Stanley Park ending up at Prospect Point. It was hotty hot, so the trail was a great place to run Friday night to escape the heat a bit. I had never done this route previously and the view was a nice reward at the turn around point! I also did the NTC Core Control workout. Saturday: The workout today was 60 mins “easy” followed by 45 mins @ marathon pace. It was also a workout where I practice taking gels. I tried two different ones: a Huma Apple Cinnamon gel and an Endurance Tap Salted Maple gel. Let me just say, these are both VERY palatable and easy to get down. I prefer the Endurance Tap Salted Maple because it is more liquid-y than most gels, easier to swallow, and only has 3 ingredients all of which are natural! The Huma one was really good too though. I digested these without any problem and will definitely use them again. Sunday: Long run day! I made a last minute decision to do VanRace 30km for my long training run this week. I figured it would be much more fun than running solo, plus the water and aid stations take care of my fueling needs and I’m always up for more practice in the race environment so on the big day, there are few mishaps! I had a great time, the weather was overcast and cool, not the case at all lately, but definitely a welcome change. I was supposed to use this as a training run, rather than compete in it, so I went in with 2 intentions: 1) to feel strong and happy after finishing and 2) to keep my average pace at about 5:30/km. I did feel strong and happy after completing the VanRace 30km yesterday, in fact, I felt like I could have kept going. I’ll take this as a good sign. When I started running, I was really trying to keep my pace slow and under control, it can be difficult to do this during a “race”. My first few km’s were: 5:38, 5:15, 5:20, 5:24, 5:25. A little faster than planned for the most part, but I was feeling SO good this morning. The next few km’s were: 5:25, 5:27, 5:23, 5:18, 5:27. The middle 10km were: 5:38, 5:30, 5:47( I think this was when I stopped to pee), 5:17, 5:28, 5:40, 5:14, 5:18, 5:07, 5:13. The last 10km were: 5:19, 5:18, 5:21, 5:32, 5:22, 5:03, 5:00, 4:55, 5:04, 4:45. During roughly km 13-25, I was running with 2 other women along the Seawall, everyone was very consistent. As the km’s started to tick by and the finish line grew nearer, one of the other ladies picked up the pace a bit, and the other started to fall back. Since I was SUPPOSED to run the whole 30km pretty slow, this kind of threw me off because it reminded me that this was indeed a race and I no longer felt like moving quite so slowly. I know a good number of people use this 30km to practice for longer races in the fall, but during the last 5km I wanted to pick it up a bit, so I went for it. I didn’t really feel like I was “working” during this race, so overall, it was a fairly easy perceived effort. This was another run where I practiced fuel intake. I fueled every 30 minutes and had 1 pack of Honey Stinger chews, 1 lemon Huma Gel, and 3 Gu gels: 2 salted caramel, and 1 chocolate. I believe part of the reason I felt so energetic was from all the fueling I did. Never underestimate the impact fueling during a run! I was very happy to have been able to ingest all of this with no GI issues. I am looking forward to more weeks like this, but if there are some less than ideal weeks that is okay too because it is all part of the process! Monday: 2 hrs “easy”, my dad was nice enough to join me on this long run and we chose to go on the sand of Long Beach in Tofino. We made it all the way to the end of the beach and back to Incinerator rock for a total of 21.4km. Running on sand is hard work! Tuesday: 1 hr “easy”, my dad also joined me for this run in Tofino. We went along the bike path on Pacific Rim highway and then turned onto the path to Long Beach, the very beginning of it, which we did not run on Monday. Wednesday: This was a speed work day, but I also wanted to try out this trail that starts on Industrial Rd. in Tofino, near Tofino Brewing. We did the warm-up through the trail which takes you to Tonquin Beach, one of the smaller perhaps less popular beaches near downtown. I knew the trail would end downtown and then the speedwork could be completed on pavement which is more favourable for hitting paces. This workout was 3 sets of 3-2-1. It felt good to get my legs moving fast again the weekends’ 30km on Saturday and the 2 easy runs at the beginning of the week. Thursday: This was 75 mins easy, I went out on the Seawall solo. I left much later than usual as I wanted to say by to my family before they left. This was promising to be a HOT day, fortunately my 10:40AM departure was still early enough and there was a nice breeze. I also did The NTC Gracie Gold Core Strength Workout today. Friday: The one day last week I was in town to lead The Sport Chek Robson Training Club group! We ran to the Burrard Bridge for some hill sprints, we haven’t done our hill sprints there in a while and a few of the members remarked on how much EASIER they felt than when we started. It’s awesome to see people feeling fitter, stronger and more confident after only a couple months of running. I did The NTC Gracie Gold Core Strength Workout again today. Saturday: This was scheduled to be a marathon pace interval day of 5km, 4km, 3km, 2km, 1km starting at marathon pace and completing the last km as fast as possible. I was a bit nervous about this because my legs were feeling heavy and tired, maybe my mental strength wasn’t there that day or maybe my legs were really freaking tired, but I started this workout and could not hold marathon pace. I opted to switch it for my Sunday long run, 2 hrs 15 min “easy”. I will do my Saturday workout tomorrow (Tuesday) and plan to nail those paces! Sunday: Months ago, I found out about this race at The PNE called the Donut Dash 5km, it sounded kind of fun to run around the fairgrounds before opening. I also like to throw in a 5km race every so often to work on speed. Since I ended up being in the middle of marathon training for this race, I did not go in with the intention of running super fast or PB’ing. My goal was essentially to practice running on tired legs and stay faster than marathon pace and I did just that. For a race that looked like a “fun run” there were some surprisingly fast runners! This race is unique because they hand out fair treats on the course, like Oreo Churros and mini donuts, I decided to forgo those though. This summer has been quite full of visitors with my parents here last week and then my boyfriends’ mom arrived the day my family left! Fortunately, I have been able to get all my running in, enjoy their company and show them the West Coast. This week will be another high mileage week and yet another visitor is coming -my friend, Jess from Toronto, who I have known since we worked at summer camp together, many summers ago! She has never been to Van so I am excited for her to experience this city! 1. Best Place to Stop on the way: Coombs Country Market/ Goats on the Roof. The journey to Tofino is not short, if you get hungry every 5 minutes like I do, you will need to make a least 1 stop to stock up on snacks. The best way to describe this place is a small town version of a Trader Joes /Pusateris, they have regular groceries, but the real draw is the gourmet and homemade products they offer. I always go for the maple smoked salmon and spicy salmon jerky! They also have a selection of cheeses, chocolates, baked goods etc. there is also a produce market behind them to grab fresh fruit and veggies. And yes, there are goats on the roof, it is covered in grass and they just kind of hang out up there. 2. Best “Quick” Lunch: I know I JUST mentioned Tacofino last Friday 5, but here I go again. This is the original location of Tacofino and definitely the best one, hands down. It is located in a stationary food truck on the way into town. They have communal tables outside the truck, which is handy because once your food is ready you won’t be able to wait to eat it! One thing worth noting is each Tacofino has a slightly different menu, this location has my 2 favourite items: the tuna taco and the chicken burrito (not crispy fried chicken). When we went on Tuesday, there was a line, but it wasn’t daunting, the kitchen works hard and pushes the food out quick. When we were just finishing up, the line had grown to 60 people deep! That’s peak season for you in Tofino! 3. 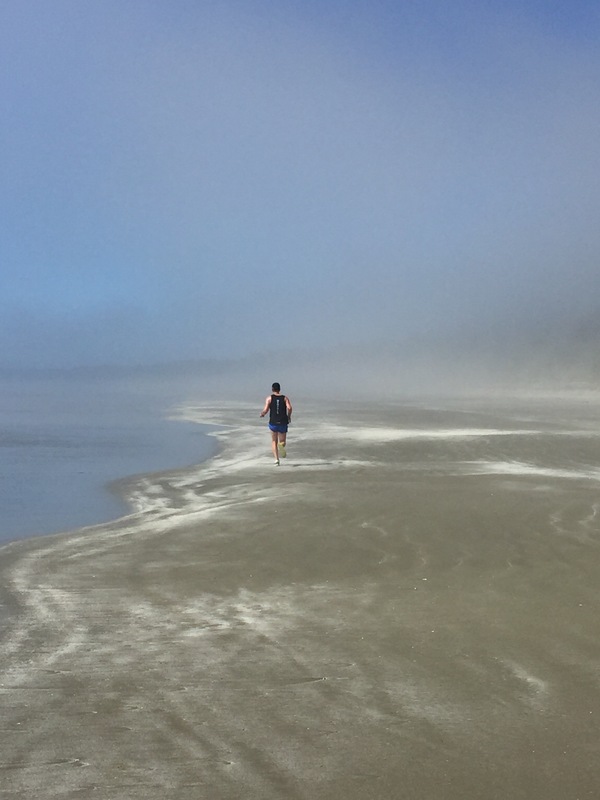 Best Location for a Long Run: I always run when in Tofino, but I had never done a “long run” there. I had a 2hr run scheduled for Monday so it was time to find an appropriate route, enter Long Beach, the name does it justice. It is 16km of sandy beach and ocean, located inside the Pacific Rim Park Reserve. I chose an out and back route starting just past Incinerator Rock to The Qwisitis Visitor Centre. The majority of the beach was empty that day and it was super foggy, but almost looked liked running into a snowstorm. 4. 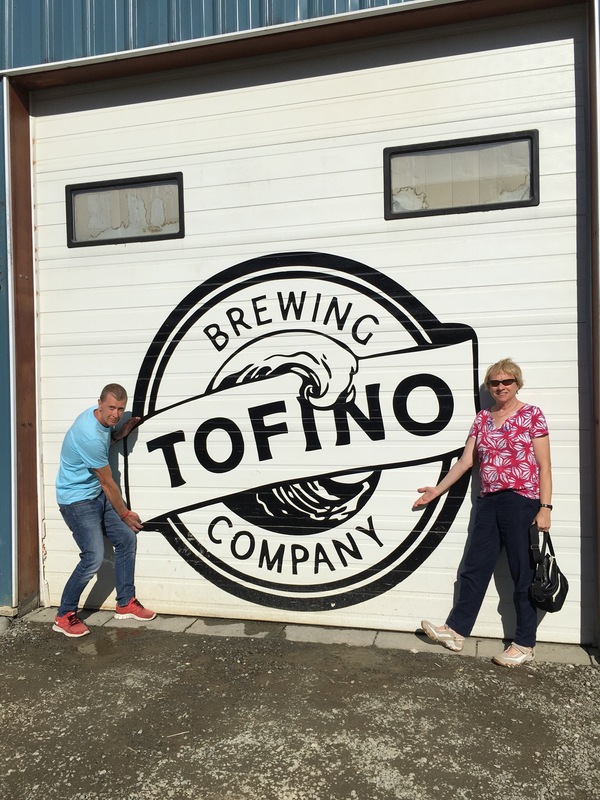 Best Place to Grab a Local Beer: No contest here, Tofino Brewing is the spot. They are located on the way into the “downtown” of Tofino, surrounded by some of the most beautiful beaches in Canada. 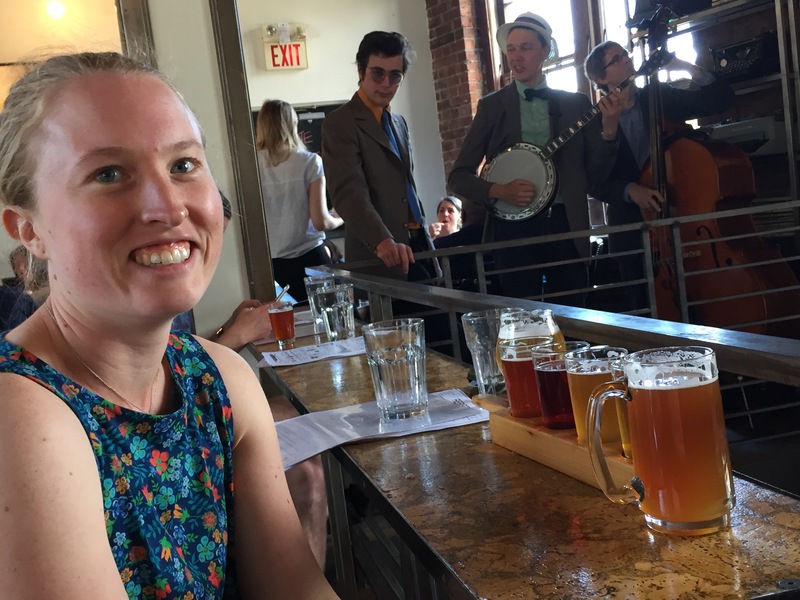 The brewery itself is proportionate to Tofino, and has only a few seating options if you want to stay there. This place gets BUSY at night, a favourite among the locals. I recommend filling a growler and heading to the beach for sunset. Or, if the weather isn’t favourable, head to Shelter, downtown, and grab a seat on the patio. They always have Tofino Brewing on draft and there are fire pits, heat lamps and you still have a view of the water. 5. Best Dinner: Since Tofino offers some great fish and shellfish available to purchase and cook, this is a great option if your accommodation has a kitchen. However, if you’re on vacation, you may not feel like cooking every night. For a nice evening out, Wolf and the Fog is a great spot. It is worth reserving in advance to secure your table. To start, the seaweed salad is my favourite, the crunch from the puffed, wild rice makes this dish. Their mains change seasonally, but you can always expect a variety of fish and seafood dishes. This time, they had halibut, ling cod, and mussels. Everyone enjoyed their dinner immensely. 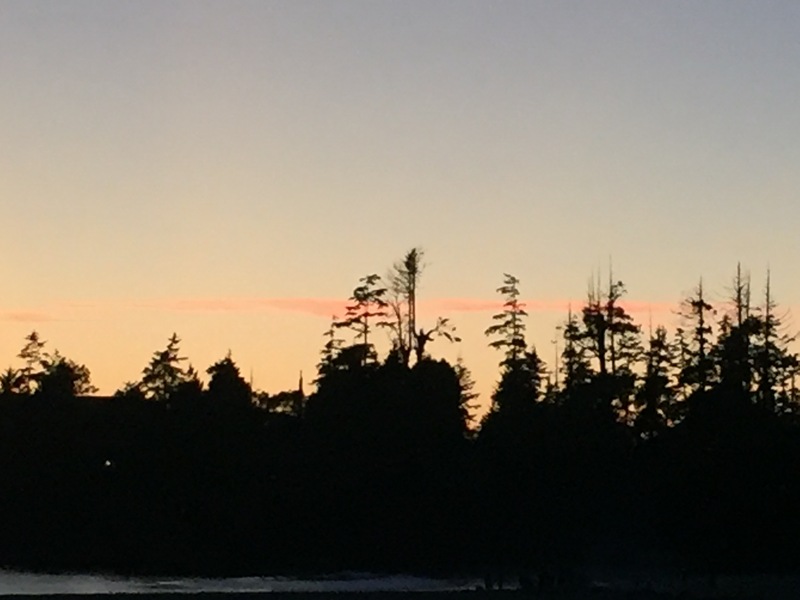 Tofino is always a nice place to escape city life and surround yourself with the beauty of the island. I ran new routes everyday, ate lots of seafood and enjoyed spending time on the scenic beaches, what more can you ask for? Monday: 55 mins easy with The Sport Chek Robson Training Club. We went along The Seawall and it was just what we needed. Tuesday: 10 min warm-up, 8 min @ half-marathon pace, 4 min @ 10km pace, 5 min @ half-marathon pace, 2 min @ 10km pace, 15 min cool-down. I did this solo on The Seawall before work. I also did The NTC Gracie Gold Core Strength Workout. Wednesday: 55 mins easy, ran with The Sport Chek Robson Training Club and we got to test out some Polar watches. I am a Garmin user so it was interesting to try another brand. We went out to Lost Lagoon for some timed intervals so those who don’t run with a watch could see the benefit. Thursday: OFF, though I did bike some 28km around The Seawall and downtown since my family is here visiting. I also did The NTC Core Crunch 2.0 it did the trick! Saturday: 20 mins easy pre-race, Seawheeze Half-Marathon, 30 mins easy post-race. I am not going to do a full race review because I was pacing a team-mate through her first half and it was HER race, but I will provide a few details. I felt great when I woke up at 5am, felt amazing during my warm-up, and in spite of the heat and humidity, I felt pretty awesome throughout the entire race! Like I said in my Friday Five: August 12, 2016 post, this is my absolute favourite race. Lululemon organizes a FLAWLESS event and it is impossible to have anything but a spectacular time. 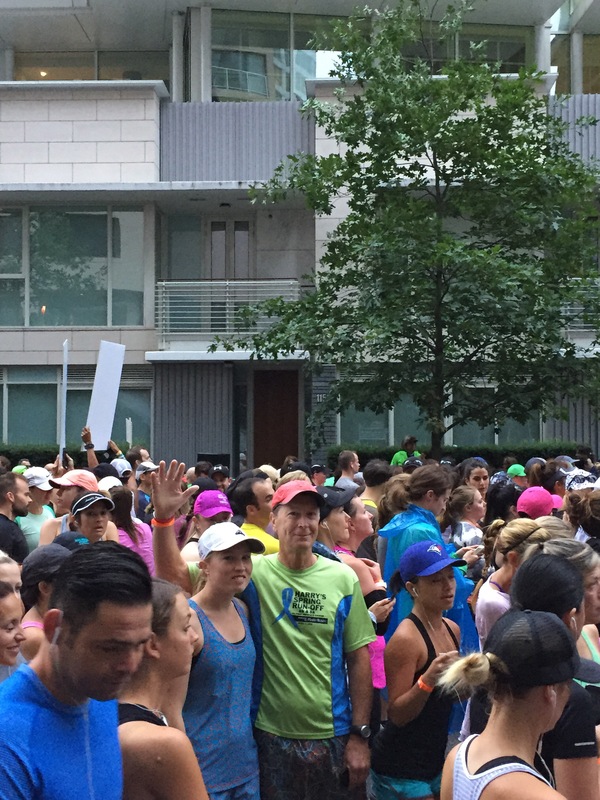 I think I had beyond runners’ high, I felt ecstatic during the entire event and for everyone around me. I will definitely be running for a fourth time next year. Oh yeah and my total mileage was 30.4 km, my longest run ever. 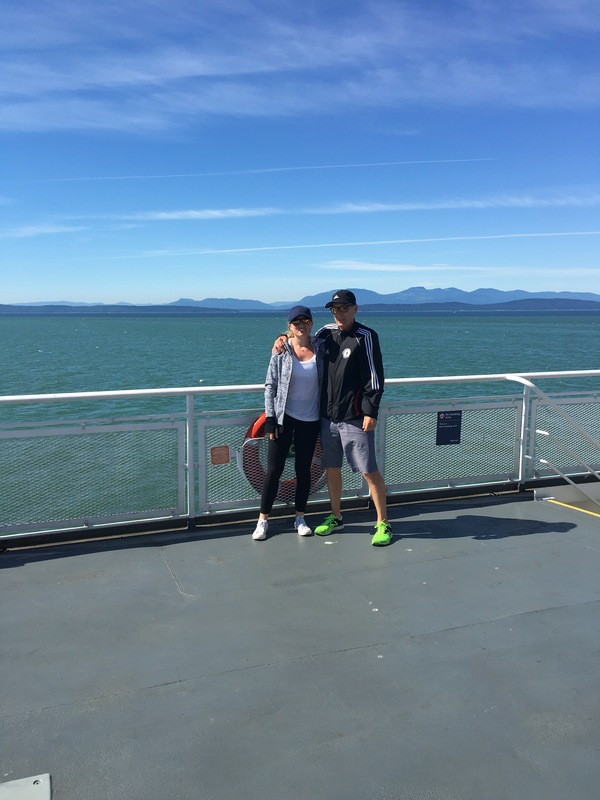 I am off to Tofino until Thursday and can’t wait to do my runs in such a beautiful location. Prepare to be Insta-spammed! The weekend of the most anticipated local running events is upon us. You know, the one that sells out faster than Taylor Swift tickets? I am referring to the Vancouver based fitness apparel giant, Lululemon’s innaugaral half-marathon, The Seawheeze. So in theme with that, my Friday Five will be about Vancouver! 1) Favourite Race: can you guess it? The Seawheeze, of course. This will be my third time running and participating in the event, and it is so much more than a race. For example, it is Friday at 4am and you would be hard pressed to find a Seawheezer who isn’t already in line or soon to be in line at the limited edition Seawheeze show case store. To everyone in line: Hey! I hope this goes by fast. Instead of having a race expo, there is package pick-up inside the convention centre, and then Jack Poole plaza is set up as an outdoor race expo with sport hydration and nutrition samples, temporary tattoos, nail polish stations etc! It is the perfect combination of fitness and pampering. The other aspect to this event is the yoga. There are 3 classes offered on the Friday before the event and then another opportunity to do yoga post-race at The Sunset Festival in Stanley Park. The event description is Run. Yoga. Party. So, The Sunset Festival is the final component. There is live music from multiple bands, food, a limited edition Seawheeze beer, shopping and even flying trapeze -seriously hoping this is back again so I can bust out some moves. I used to do flying trapeze every weekend when I was in middle and high school. If you haven’t already done or wanted to do The Seawheeze, I think it’s safe to say you do now! 2) Favourite Cafe: Birds and the Beets, in Gastown. They get beans from Bows and Arrows which is located in Victoria. I typically get and americano, but the lattes are amazing. If you aren’t feeling like coffee, they have homemade kombucha and craft soda. They bake fresh bread and treats daily, so be sure to try something with your coffee. 3) Favourite Juicery: The Juice Truck! 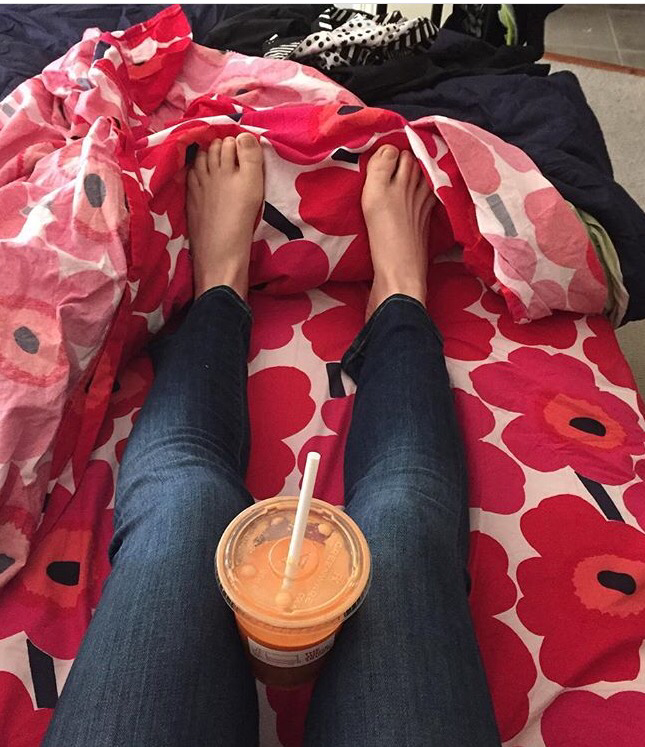 I like to get their Turmeric Tonic the day before a longer race. It also has pineapple, orange, ginger, lemon and carrot in it! So tasty, and… turmeric! 4) Favourite burrito: Tacofino Gastown! They also have an East Van location and a Yaletown location as well as a few trucks around town. Not recommending you eat this pre-race, but definitely good for lunch after you are done. It will replenish your carbohydrate stores for sure. I usually get the veggie one and add guac, obviously. 5) Favourite spot to grab a beer: The Alibi Room in Gastown. Post race you deserve a beer! I heard about this place even before I ever visited Vancouver and it does not disappoint. They have the largest and best selection of draft craft beer in Vancouver and probably all of Western Canada. I like to sit at the bar to get insight about beers I have not tried and get my beer nerd on. If you’re hungry, the food is good too, best chicken wings ever with aged garlic vinegrette and cilantro! Happy Seawheeze and have a great weekend! I spent the last 4 days in Squamish, BC to partake in a run training camp with my coach and a few of the other ladies she works with. There was a lot of running (duh), some beach time, a lot of eating and exploring the town and an 8km race. I will go into detail day by day, but I will divide them up because it will be way too long for a single post! After that I quickly showered, grabbed my bags and hopped in a cab to the Greyhound station. The bus departed from downtown Van at 10:30am and arrived in Squamish at 11:50am, not bad at all. My AirBnB host graciously offered to pick me up from the station in Squamish, and showed me some cycling routes around town. The rest of the group was coming from Victoria late afternoon, so I had a day to myself. I dropped my stuff off in my room, changed into workout clothes and prepared for an adventure. My plan was to cycle downtown and grab lunch, cycle to the base of The Chief and hike to the top. The ride downtown was easy and flat, I rode on the highway which wasn’t as scary as you might think. For lunch, I chose Zephyr Cafe (38084 Cleaveland Ave, Squamish, BC) they have a very healthy menu with salads and rice bowls etc, and cater to vegetarians, vegans, and gluten free diets. Though I eat everything, I prefer health centric dinning options and Zephyr was awesome! I had a rice bowl with organic chicken, it hit the spot and fueled me for my adventure. Then it was time to ride to The Chief, Google Maps said it was only 3km away, down highway 99. No problem! Well, I made it those 3km and found the left turn, but instead of noticing the minuscule sign indicating one of the parking lots for The Chief, I kept on going. I totally blame Google Maps, well, mostly. It said to continue and so I rode up and up this gravel road. I later realized this was a logging road called The Sasquam River Trail, which explained why I was the only person on it aside from a few cars parked here and there doing who knows what. In the spirit of adventure I kept on going, hoping The Chief was around the corner. After an hour or so and a lot of climbing, I decided I didn’t need to climb The Chief and turned around. Biking up hill was hard, biking downhill was freaking scary on a gravel trail where brakes don’t respond as quickly as they do on concrete. I made it out of there with no damage and to my surprise, there was The Chief on my left hand side, where I had began my bike ride to nowhere! I ate a protein bar, took a bunch of pictures, rested my legs for a bit and then decided it was time to descend because I was hungry for dinner and Mags 99 was calling my name! The descent was even harder, my legs were shaking and twitching. I had planned to stop at the waterfall and soak my legs for a bit in what I figured would be very cold water, that plan went sideways when I was greeted by a giant, scary, barking dog who ran towards me. Getting a dog bite half way down The Chief was not on my agenda, so I carried on. I got to the bottom, jumped on the bike and headed to Mags 99, a mexican restaurant and Squamish classic just off the highway, near The Chief. I got their salad with pulled chicken and a Howe Sound Lager, beer never tasted so good. We had a trail run planned for Friday morning, so I knew I had to do something to relieve my legs and grabbed a big bag of ice from the gas station on my way home and spent the next 2 hours icing various parts of my legs.